Large Ceramic Tile Saw Scrubber Details - Quasius Equipment, Inc.
Our Pro Cut Large capacity ceramic tile saws are similar to the standard tile saws except the increased size of the bed and table means you can easily handle the larger 18" tiles. The powerful 1.5 HP motor turns a 10" diameter continuous rim diamond blade to give the best possible cutting performance. The water pump will pump water out of the easily drained tray to hold down dust and keep the blade cool. The sliding tray lets the operator feed the tile through at a controlled rate for accurate and smooth cutting. The open design of the 20" x 17-1/4" table lets you cut 18" tiles without overhanging the bed. 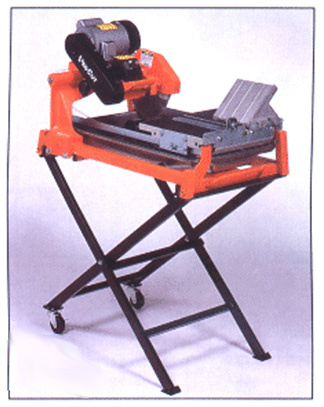 These compact units can be easily transported in most vehicles and can be set up any where to do your cutting. A folding stand with twin castors is included for your convenience. You will require a 20 amp circuit to run it and some water to fill the tub. The unit easily cleans up with a garden hose when the job is over. The 10" diameter diamond blade is included with the saw at no extra charge. If your tiles are large, our Standard Size Ceramic Tile Saw handles tiles up to 13" square with ease.